Yay. It’s that time of year again. J and I went to both of these last year and came home with some reallygood stuff. Our calendar’s marked for this years market. J got the following message from a Facebook group. Explore companies selling a variety of Michigan crops including pies, fruits, vegetables, honey, nuts, flowers, maple syrup, and so much more! This is the first I’m hearing of this. I’m sure J and I will be checking it out soon! From a press release…..
Every Saturday, Benjamin Davis Park is the place to be for Fresh Food, Fitness, and Fun! 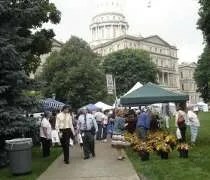 Lansing, MI – June 3, 2009 – For years, residents across South Lansing have wanted a farmers market where they could purchase fresh, locally grown produce. 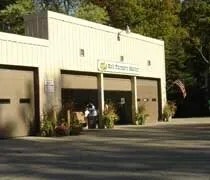 In addition, residents in Southeast Lansing have wanted a safe place to walk and bike in an area that lacks sidewalks on several major roads. Thanks to the South Lansing Community Development Association, both dreams are about to become reality. When: Saturday, June 6, 10 a.m.
Join us as we officially open our new market and the new 3/4 mile paved path. Shop at the market, meet local growers, learn about food preservation, try new recipes, stroll along the newly paved walking path and visit with neighbors. Our market is unlike any other because it offers produce from community growers and urban yard gardeners as well as local farmers. This Saturday, the market will offer early harvest produce, including asparagus, radishes, rhubarb, salad greens, spinach, Swiss chard, and turnip greens, as well as garden starts and potted perennials. We’ll also have a children’s activity table and information on food preservation presented by MSU Extension. Throughout the season, we’ll offer a growing variety of fruits and vegetables, as well as value-added products like dips and sauces, jams and jellies, honey, maple syrup, baked goods, and soaps. 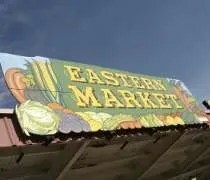 The market and the path were made possible with support from the Michigan Department of Community Health, the Ingham County Health Department, the Lansing Parks & Recreation Department, MSU Extension, and members of the South Lansing community. Saturday, February 28th was a big day for J and I. We delayed our Valentine’s Day celebration by a couple weeks because of a concert in Windsor. I got J tickets to see Miranda Lambert and in return, she got reservations to Roast in Detroit for me. When the day finally came, both of us were anxious. We had been looking forward to this day for so long, it was hard to sit still. Early in the day, we decided we just needed to leave and go to Detroit even though our reservations weren’t until 6:15. To kill time, J suggested we check out the Eastern Market. 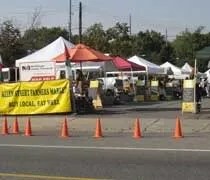 The Allen Street Farmer's Market on the corner of E. Kalamazoo and Allen Sts. A few weeks ago, I wrote a review at the Ann Arbor Farmer’s Market (review HERE) and raved about the selection of peppers and fresh herbs. Jackiecat was quick to point out that a lot of those same ingredients were available at Markets here in town. She suggested both the Allen Street Farmer’s Market and the Meridian Farmer’s Market. I had heard about the Allen Street Farmer’s Market, but haven’t been there yet this summer. J goes to work at 3:00 and the Market opens at 2:30 so there was really no time for us to go together. I suppose I could always go by myself, but she eats most of the produce and I’m not very good at picking out what’s good and what’s not. We didn’t plan on going to the Farmer’s Market. In fact, it wasn’t even on the radar when we got out of bed. I hadn’t even heard of it. After enjoying lunch at The Black Rose Irish Pub (review HERE), we headed out to the Frederick Meijer Gardens. We pulled up and thought, “Wow, this looks really cool.” We got inside thinking there’d be a little bit of an admission charge, but $12?! To look at flowers? No thanks. We passed and got back in the car not knowing what to do now. 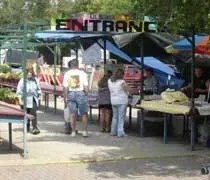 I looked at the local attractions section of J’s Garmin GPS and the words “Farmers Market” came up and it was only three miles away. I hit go and we headed back the other direction to see what kind of Farmer’s Market we were going to find.